Mick Taylor’s hopes of seeing his Bamber Bridge side put an end to their dismal away form were dashed in a 2-1 defeat at struggling Workington in the NPL Premier Division. With only one win on the road all season, Brig made the worst possible start in the 13th minute when Sam Joel put the hosts in front. Hopes were raised for the away side when Scott Harries put them back on level terms three minutes later. 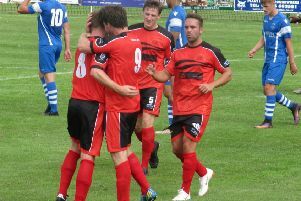 But 20 minutes from the end Sam Smith netted the winner for the Reds. Elsewhere in the division, Lancaster City earned a point in a 1-1 draw at Warrington Town. The Dolly Blues thought they had all the points in the bag when Brad Carsley continued his scoring exploits by finding the net in the 83rd minute. But a last-minute strike from Tony Gray ruined City boss Mark Fell’s day. In the NPL West Division, Kendal were hammered 8-0 at Atherton Colleries, Tom Bentham doing the bulk of the damage by scoring six times. Clitheroe lost 2-1 at Newcastle Town, Harry Pratt getting the visitors’ consolation goal in Staffordshire. Ashley Hemmings scored both goals as hosts AFC Fylde beat Wrexham 2-0 in the National League. And in the National League North, Southport had Liam Edwards sent off in a 1-0 defeat at Altrincham. In the NWCL Premier Division, Charnock Richard were beaten 4-1 at home by Runcorn Town. Carl Grimshaw got the home side’s goal in the 90th minute. But Burscough’s scheduled trip to Irlam was washed out by the weather. In the NWCL First Division North, Garstang came from 3-1 down to grab a point in a 3-3 home draw with Cleator Moor Celtic. Tom Mahone (penalty) and Leigh Dunn netted for Celtic but Rick Coar pulled one back on the stroke of half-time. But it was 3-1 when Dunn found the net in the 63rd minute. Dan Birch (69) made it 3-2 and Shaun Sailor levelled in the fifth minute of added time. Longridge Town beat Chadderton 3-1 with goals from Jay Hart, Richard Allen and Thomas Ince.